BELFAST, Northern Ireland, 2018-Oct-08 — /Travel PR News/ — A new security search system and equipment at George Best Belfast City Airport has slashed average passenger processing time to only 6 minutes. 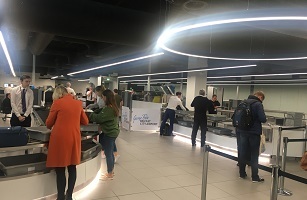 The £1.5 million investment has seen the complete refurbishment of the security search area, with the introduction of new security lanes which can process up to six passengers at a time. New electronic boarding pass gates can now process multiple passengers and new scanning equipment has seen queues at peak times disappear. “We want to exceed our passengers’ expectations when using the airport and the new security search system has to date received hugely positive feedback from passengers. The investment in security is part of £15 million infrastructure investment which includes a major upgrade of the departure lounge including retail, food and beverage offerings. Additionally, customer seating has already more than doubled, as have airside customer washroom facilities. The investment also includes the purchase of a new fleet of Airport Fire appliances the first of which arrived last month. The works to security and departure facilities will be fully completed by November 2018. This entry was posted in Airports, Travel, Travel Safety, Travel Services, Travel Tech, Travelers and tagged George Best Belfast City Airport, Mark Beattie, security lanes. Bookmark the permalink.